celebrated in communities from coast to coast. Established in 1956, National Bike Month is a chance to showcase the many benefits of bicycling — and encourage more folks to giving biking a try. National Bike to Work Week 2017 will be held on May 15-19. Bike to Work Day is May 19! As a national sponsor, the League provides resources to help you plan an event in your area, and each year the number and diversity of Bike Month celebrations continues to grow, accelerating the momentum around bicycling nationwide. 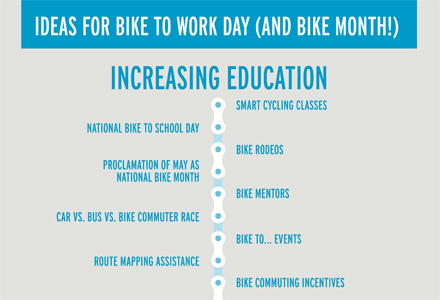 Click the image to download the League's Bike Month Guide with the ideas, information and framework you need to plan a successful event.